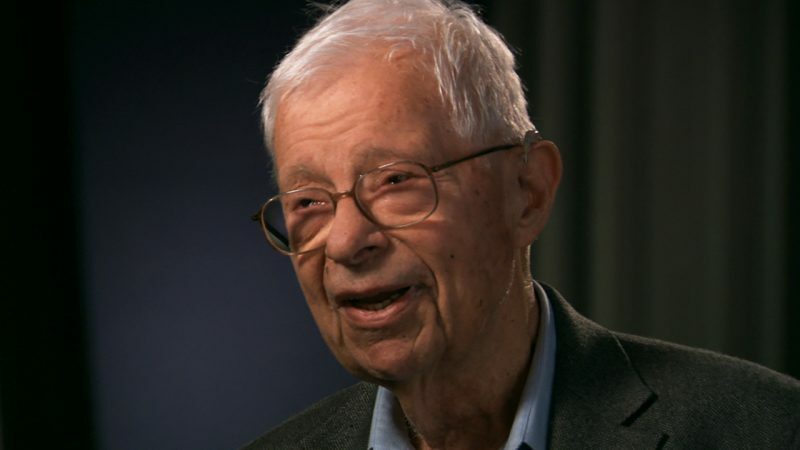 Daniel Schorr reported on national and international issues for more than 60 years. As a foreign correspondent for CBS News, Schorr covered Russia and Eastern Europe. As a Washington correspondent, he covered the McCarthy hearings and the intelligence organizations. He was one of the most hated reporters on Richard Nixon’s “enemies list.” He helped create CNN and was an analyst at NPR until his death in July 2010. Schorr’s journalism career begins at age 12 when he reports on a woman who jumped or fell from his apartment building’s roof. After calling the police, Schorr calls his local paper, the Bronx Home News, and relays the story. He is paid $5 for his information. Schorr receives a bachelor’s degree from the College of the City of New York. During his studies, he also works for a number of small New York dailies, such as the New York Journal-American. Schorr serves as the New York editor for the Dutch news agency ANETA. Drafted into the U.S. Army during World War II, Schorr serves for two years in the Army intelligence unit. Beginning a 20-year career as a foreign correspondent, Schorr writes from Western Europe for The Christian Science Monitor and later The New York Times. Edward R. Murrow notices Schorr’s reporting and asks him to join CBS News as its diplomatic correspondent in Washington. The position allows Schorr to travel on assignment to Latin America, Europe and Asia. Toward the end of Sen. Joseph McCarthy’s witch hunts for communists , McCarthy turns his accusations in the direction of the Army. Schorr covers the Army-McCarthy hearings . For the entirety of Schorr’s two-year stay in the Soviet Union, he runs into trouble with the KGB, the secret Soviet intelligence agency, for resisting its censorship of his stories. At one point, Schorr is following Khrushchev on a story and he passes out from a “KGB Mickey Finn” someone had slipped him. He is eventually barred from the Soviet Union in late 1957 for censorship-related disputes. Schorr returns to the U.S. and reports from Washington and the United Nations for CBS. When Khrushchev famously tours the United States for two weeks , Schorr covers his trip. That same year, Schorr interviews Fidel Castro in Havana and travels with President Dwight Eisenhower to South America, Asia and Europe. Assigned to Bonn, Germany, as CBS bureau chief for Germany and Eastern Europe, Schorr covers the Berlin crisis and the building of the Berlin Wall. Retiring as a foreign correspondent, Schorr is reassigned to Washington. He focuses his reporting on American societal issues, including health care, poverty, education and pollution. Schorr reports on the Senate Watergate hearings, for which he won three Emmy Awards and famously reads on-air Nixon’s “enemies list,” which included his own name. Schorr covers the House Select Committee on Intelligence known as the Pike Committee, which investigated illegal activities involving the CIA and FBI, including the attempted assassination of foreign heads of state. The committee votes 6-5 against a contempt citation for Schorr. Schorr resigns from CBS News despite its requests for him to stay. He briefly lectures at the University of California, Berkeley, and becomes a syndicated newspaper columnist. Schorr’s book “Clearing the Air” discusses his account of the events around the Pike Report. Ted Turner asks Schorr to assist in the creation of Cable News Network, where he serves as the senior correspondent for five years. Facing restrictions on his editorial independence, Schorr leaves CNN and begins working primarily for NPR. Schorr contributes regularly to “All Things Considered,” “Weekend Edition Saturday,” “Weekend Edition Sunday” and NPR’s live coverage of breaking news. Schorr is inducted into the Society of Professional Journalists Hall of Fame. Schorr continues to work for NPR until his death on July 23. He was 93. “Don’t Get Sick In America!” Nashville: Aurora Publishers, 1970. “Clearing the Air.” Boston: Houghton Mifflin, 1977. “Staying Tuned: A Life in Journalism.” New York: Pocket Books, 2001. “Come to Think of It: Notes on the Turn of the Millennium.” New York: Viking, 2007. Schorr, Daniel. “Staying Tuned: A Life in Journalism.” New York: Pocket Books, 2001.